Is Your Windows system is running slow or recycle bin suddenly disappeared? The Internet is connected but you are unable to open pages? Or there may be any other sudden problem in your windows system like unable to open task manager and registry editor. 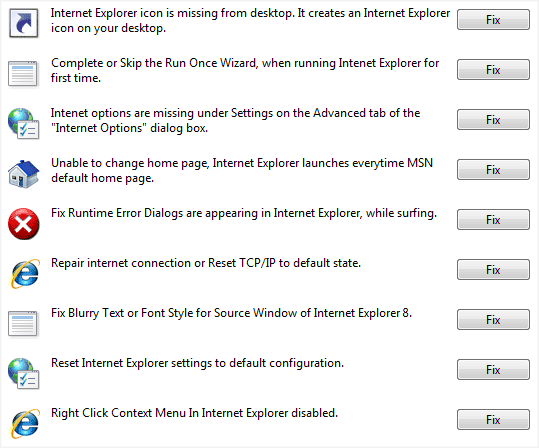 These are few common issue of Windows system. I saw many people calling for technical support to solve these issue. Most of the Indian tech support charges high enough to solve these problems. If you are facing this kind of problem in your system, you should first calm down and start thinking what may be the reason. Most of the times, these issue arises due to change in windows registry files. Virus programs modify the Windows registry and then disable the registry editing. So, it is hard to revert back changes by your self. But it is not impossible to do this and you do not need to call for a tech support. 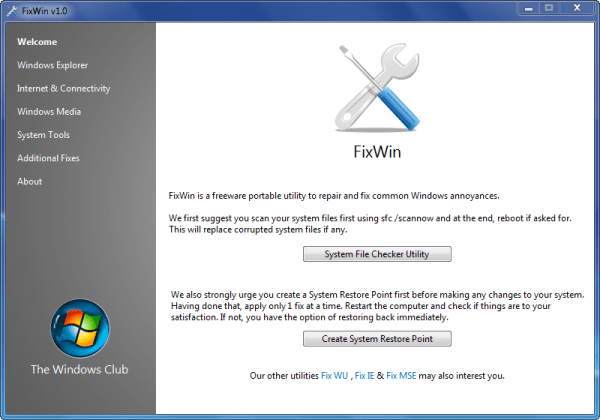 I found a nice tool called Fixwin that can solve most of the Windows related problems in one click. FixWin is a free utility for Windows. It can repair many Windows problems. The tool works on both 32 bit and 64 bit version of Windows. It is very small in size and needs no installation. Fixwin claims to solve more than 50 common Windows issue related to Windows Explorer, Internet & connectivity, System tools, Media player and many other. So, you can carry it with you in USB drive and use whenever you face any problem. Run the tool and then click on ‘System File Checker Utility’ first. It will scan the system and check the possible issue. If it asks to reboot, do it. Next, it asks to create System Restore Point. After that, it will show you the issue along with a Fix button. You can click on Fix button to solve the issue. So, next time when you face any problem in Windows, try Fiwin before calling for a tech support.